Still the Best in Meath! 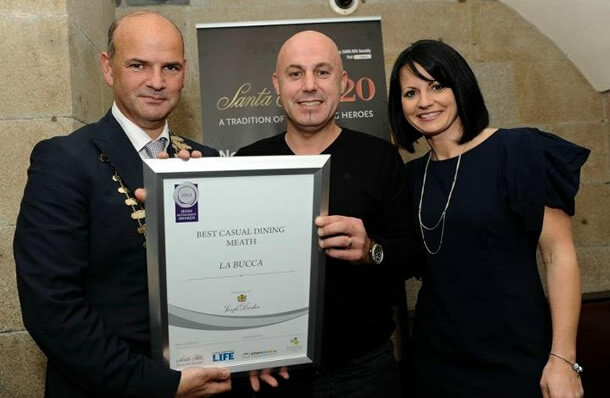 For the second year running La Bucca restaurant in Ashbourne has been honoured by the Restaurant Association of Ireland & voted the best in their category. Manager Dave Doyle and Marketing & PR Manager Niamh Cardiff were at last week's awards ceremony in Dublin's Westin Hotel to collect their award for Best Casual Dining Experience, this follows last year's award of the Best Restaurant in Meath. "Since their inception, the Irish Restaurant Awards have cast a spotlight on Ireland's hottest restaurants & chefs. They have become a byword for quality, class & achievement…they are the awards everyone wants to win. We celebrate the award winning cuisines and the great restaurants and chefs who have brought international recognition and accolades to the Irish restaurant scene. 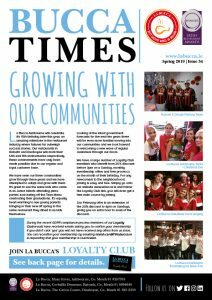 We are the economic engine rooms in every town in Ireland, creating and maintaining much needed local employment"
La Bucca are proud to be associated with the awards and have now been nominated for the prestigious "Best in Leinster" awards to be announced in the Burlington Hotel on Monday 14th May. Speaking after the awards Russell Bailey, owner of La Bucca said,"We are very fortunate to have such a strong, long term team of loyal staff who are dedicated to providing a level of service & standard of food quality that enables us to compete with the very best. Throughout the economic downturn we have maintained our standards & haven't compromised our food offering or our service in any way. In fact we have consistently strived to raise the bar by continuing to develop our menu & by offering new & innovative specials and promotions'. 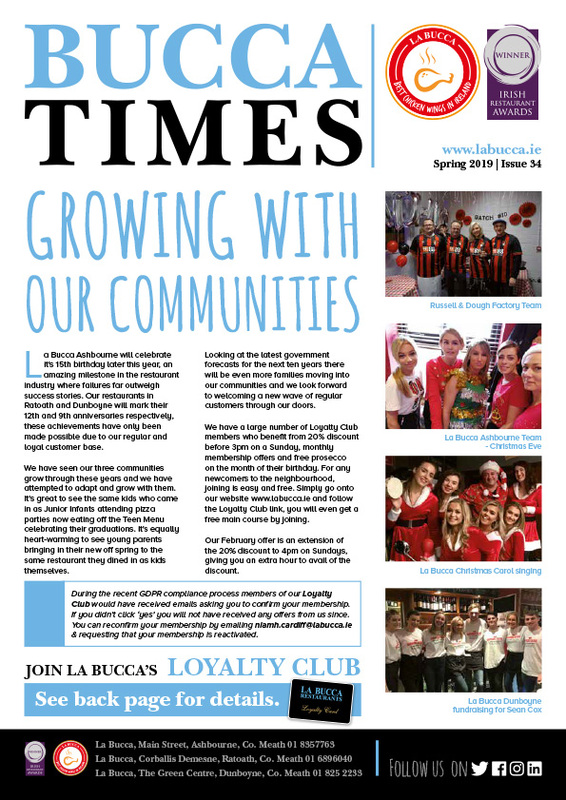 La Bucca Ashbourne was opened in 2004 and over the years has become an integral part of Ashbourne community life. The company expanded & opened it's sister restaurant in Ratoath in 2007, followed by the recent addition of a third restaurant in Dunboyne. All our restaurants follow the same basic principles of serving good quality, freshly prepared food at value for money prices in clean, stylish surroundings. Between the three Meath restaurants there are now an impressive 75 employees, proving that the restaurant industry really does help to keep local economies alive, with help of course from the patronage of all our regular customers.